TBQ’s Alexia Nader interviews Adam Green and Stephanie Taylor, founders of the Progressive Change Campaign Committee (PCCC). PCCC co-founders Stephanie Taylor and Adam Green with Senator Elizabeth Warren (D-MA) at Netroots Nation 2012. After meeting as student activists and organizers at the University of Virginia, Adam Green and Stephanie Taylor worked at MoveOn.org before leaving to found the PCCC. Prior to that launch, Green had worked in press and communications for several Democratic campaigns and party committees, while Taylor spent several years as a union organizer of health care workers in West Virginia, Kentucky, and Ohio. PCCC’s stated mission is “to build progressive power by changing who holds power.” Their website’s domain name is even more succinct: BoldProgressives.org. TBQ: How did the PCCC get started? AG: At MoveOn we started talking about how it really matters who holds power and that there weren’t enough resources for genuinely progressive candidates to run top-notch campaigns and win. To their credit a lot of online organizations require a local member mandate in order to endorse in a primary. One practical gap that leaves in the progressive infrastructure is that local candidates on the ground often don’t get attention until the final week of the election. That means that even if everybody in the know understands who the bold progressive candidate is, some organizations have their hands tied until the very end, or never can endorse at all. The political party committees look for self-funders and more conservative Democrats; they care about the fundraising not their progressive values, and that means that everybody knows that there’s a progressive, viable candidate in a primary who’s falling through the cracks. What we really care about is impacting policy. Whereas a lot of the political party’s jobs end on Election Day, our job begins on Election Day. What we’re really doing in the campaign process is teaching campaign candidates how to fight as part of a larger grassroots movement such that when they’re in office, it’s intuitive to them to marry their efforts to a larger movement, and have an effective inside-outside strategy to move the legislation forward. Therefore we don’t have to teach old dogs new tricks, we teach new dogs new tricks and that carries over to what we really care about, which is people-powered government. This is how we operate; very deep work on the electoral side, building up candidates, teaching them how to fight for a movement, and similar deep work on the issue advocacy side. TBQ: What do you look for in someone you would consider a truly progressive candidate? Are these different qualities than what we see in a lot of Democrats in Congress? ST: We look for candidates who are going to be organizers inside Congress for the issues that matter to progressives. Candidates who aren’t just going to vote on our issues some of the time but who are actually going to be in there fighting day in and day out for the progressive agenda. So I really think it’s the difference between somebody who is intent in their own liberal politics, and someone who is willing to go to the mat for truly progressive progress. ST: Well she is, and if she’s the first person who sprung to your mind, I would urge you to think about why that is. She is seen as being such a progressive fighter because she uses her power to advance the progressive agenda. When she’s sitting on the committee hearing, she actually uses her seat to ask the tough questions of the people who are supposed to be regulating and policing the economy when they fall down on the job. She’s put forward an incredibly important proposal to lower student loan interest rates to help alleviate this crushing burden that so many young people are under economically. That’s someone who is holding office, but isn’t just holding office: she’s working everyday to use her office to make people’s lives better. AG: We found that even if we put in ten thousand phone calls to the front desks of congressional offices, they have little impact unless they’re connected to a tangible piece of legislation or a legislative vehicle. What that means is if there’s a sail, our phone calls become the wind that pushes the vehicle forward and allows a bill to jump from twenty co-sponsors to fifty co-sponsors to a hundred sponsors over time. That’s how we can actually make our grassroots activism effective as opposed to just doing activism in the ether.So what does that mean for what we look for in a leader? It means that we need someone who’s committed to operating as part of a grassroots movement, and operating as part of a larger movement. That includes partnering with the grassroots and thinking about how to govern in that way and understanding that merely dropping a bill in the hopper and having no actual plan for moving it on a grassroots level and getting media attention for it isn’t very effective. There’s a lot of people who just drop bills in the hopper and then say, “I’ve been fighting for the district for twenty-five years!” Well, that’s a very loose definition of fighting. We want people who are effective and who understand that being effective means mobilizing millions of people who are willing to go bat if they’re involved in a partnership. So for Elizabeth Warren, that’s exactly what she did during the fight for the Consumer Financial Protection Bureau. She actively coordinated with grassroots organizations who represent millions of people and can mobilize them around her idea. Those people said, “We never have a chance.” It’s with that ethos that she is operating now in Congress. Not just proposing good ideas but doing it in partnering with the grassroots, and that extends in what we look for in other candidates as well. Last cycle we hosted a media training for some PCCC candidates to help them be as effective as they can be, and the next day we did a joint press conference with all of them delivering a petition to John Boehner’s office saying, “We stand with the 99%, pass the jobs bill.” This was during the Occupy Wall Street heyday. These candidates got on CNN and MSNBC as well as reports in the Huffington Post, the Washington Post, and others. Then one of the candidates in particular who never got any local TV attention before this moment was featured on the local ABC news because they had seen the CNN piece and wanted to feature a local candidate who was part of this national movement, this national push. And all at once these candidates realized, Oh, by working as part of a movement, coordinating my efforts with others, and including sharing this credit at the press conference, all of us benefited. We all got more attention, we all had a grassroots at our back, and media attention resulted from that. So when we go to those people when they’re in Congress we say, Hey, instead of being lonely and dropping a lonely bill in the hopper, why don’t we all team up and push a big agenda forward together? Again, having this be intuitive to them, why it’s effective—this gives you some context for what we mean by people who are actually organizers in Congress and partners of grassroots and why that’s part of our model. Being public and outspoken is necessary but not sufficient… Being a loudmouth for its own sake is not effective. ST: And just to add a final concrete example, Alan Grayson is a Democratic congressman from Florida, and he’s another incredibly effective organizer inside Congress. There have been repeated attacks over the last few years that are ongoing against Social Security. Grayson has been fighting really hard to protect social security. He teamed up with Mark Takano, who’s a freshman congressman from California, and they put together the Grayson-Takano Letter, which says, “I will not vote for anything that cuts Social Security, Medicare, or Medicaid benefits.” This is a really important letter—because progressives have real power right now, because any kind of fiscal deal or budget deal to pass the house will need progressive support, because there’s a block of key party Republicans who won’t vote for anything—so the Democratic Caucus needs to be incredibly unified. The more progressives who show that they won’t vote for cuts, it just has a real impact when you’re looking at the calculus of what can get through the House and what can’t. So it’s an incredibly, incredibly important letter. Still,Grayson didn’t just put his name on it, he was on the floor of the House with this letter of leadership and activism that we need from our allies. TBQ: So it’s also about, in a sense, outspokenness, as a quality of candidates that you would want to support and help. ST: A better way to characterize it is effectiveness. AG: Being public and outspoken is necessary but not sufficient. There are some loners in Congress who go on national TV and say things that I’d agree with but who have no effective strategy for actually doing those things. So being a loudmouth for its own sake is not effective. Being vocal while having an actual strategy to win is the quality that we look for in candidates. So the reason being vocal is important is we disagree with the idea of stealth awesomeness, which is basically the idea that we won’t talk about any of the progressive values that we have on the campaign trail, but trust us, trust us when we get elected we’ll do great things. That never works, right? And the fact that everybody thought that labor would pass the Employee Free Choice Act after we had a Democratic president and Democratic Congress and therefore no Democrats were actually asked to talk about labor issues on the campaign trail, all that led directly to Employee Free Choice Act never even getting a vote. They didn’t bring any voters along with them. So yeah, being vocal is important, and also being effective and working as a partner with the grassroots. If you poll on issue positions, time and time again the vast majority of the country will agree with the progressive position. TBQ: This grassroots energy is also carried through in terms of fundraising for campaigns, I’m thinking of Warren’s 2012 campaign in particular. Could you talk about how you helped her fundraise? AG: Sure. I’ll just let you have a couple of top-line facts. We raised 1.17 million dollars from nearly seventy thousand small-dollar donations. We ran the Elizabeth Warren for Senate campaign about two months before she decided to run, raising $100,000 in a draft fund that she got on day one of her campaign. We held house parties across Massachusetts to make sure that the type of grassroots support she could count on was very visible if she made the decision to run. In the final month of the election we made 574,000 phone calls for her campaign from our national volunteers, from non-competing blue and red states, who wanted to help her win. How did we get this type of grassroots support for her? What we find in general is that we’re able to do our job best if we can show and not tell. People are sick of politicians making promises to them and not following through on those promises. Therefore an organization merely vouching that this person will be great when they get into office is the low ebb of our ability to inspire people. The high tide is when we can say, look at what this person is doing right now in real time to move forward the issues we all agree on. Elizabeth Warren, who doesn’t even know she’s being videotaped, says nobody gets rich on their own. We need policies that reward success but also pay it forward to the next kid. And that gets a million hits on YouTube. That shows in real time the way that she’s a game changer. It’s interesting that Obama attempted to emulate that and kind of flubbed it [with the “you didn’t build that” gaffe]. She nailed that message because it’s suited to her. She was out there campaigning for more regulation of Wall Street when many other Democrats had shied away from that. She was already changing the debate early into her candidacy, and for us to build a fight for that allowed us to fundraise. When Karl Rove attacked her with some really weird ads that highlighted the fact that she was for Wall Street reform, we raised one hundred thousand dollars for her over a weekend, just because we were able to say, Look, people you distrust dislike her enough and know that she would be effective enough that they’re putting money into ads [against her]. We had a partnership with her, so the Saturday before the election she took time out of her schedule between rallies to join a national conference call with our members—to talk to them about the campaign and to answer questions from them. It was a really moving phone call. Her doing that sends a signal to our members about the type of partner she’ll be on the inside. She’s not just asking from afar for our support and then talking to her real supporters somewhere else; she’s taking time out of her schedule to talk to her real supporters, which are us, our larger membership, our grassroots base. People might donate fifty bucks online, but they can do a lot more and do something that’s really fulfilling for them and is immensely valuable for our campaigns. TBQ: What are the demographics of your membership like? TBQ: Is it a younger crowd or middle-aged or a mixture of both? ST: It’s moms, dads, veterans, retirees, students, professors. When I say “everybody” I think that it’s really an extremely wide demographic. I think it’s important to note that we believe that our politics fall very strongly where the majority of the country falls. If you poll on issue positions, time and time again the vast majority of the country will agree with the progressive position. Back during the public option fight [over the proposal to include a government-run health insurance plan as part of the Affordable Care Act], polls showed that 82% of the country supported a public option, which is quote, unquote “radical government sponsored healthcare.” You would see even the majority of Republicans would support a public option. A vast majority of the country supports a common sense gun reform, a vast majority of the country supports prosecuting Wall Street bankers who tanked our economy. These are positions that are seen as progressive, and yet we feel that they are very centrist positions and that they are in the center of the country, they’re in the mainstream. I think it’s not really surprising that we would have such a diverse demographic that really represents the entirety of the American population, because three quarters of the American population agree with each other on these progressive principles and these progressive issues. TBQ: Stephanie, one of your interests and focuses is on technology and how that intersects with activism and grassroots energy. Are there any upcoming projects you’re excited about? ST: Well we are about to launch our set of campaign tools that we’ve been developing for the past year that will make it much easier for candidates and staffers to run campaigns. I think that the political possibilities that the Internet has opened up are really astonishing in terms of what we can create, not only to mobilize huge numbers of people to fight for the issues that we care about, but we can also create tools that have interfaces that are really self-explanatory and guide people to engage in best practices. So someone using our tools who doesn’t really know what they’re doing can be guided in an intuitive way to use best practices when they’re fulfilling the functions of a campaign. ST: It’s campaign software. We’re not ready to say more publicly yet. TBQ: Do you have any other projects that are coming up that you’d like to talk about? AG: So a big piece of what we do is take on or fight against consultant waste to infuse progressive campaigns with best practices, where they can do better work for cheap. And this gets to a couple exciting things, so we’re not ready to talk about all the details of the campaign software yet, but the bottom line is it will sideline a lot of exorbitant consultants and save progressive campaigns millions of dollars this cycle by having cheaper, better tools to do what consultants were needed for ten or twenty years ago. The basic idea is, along our many numbers, there are people who do a lot more than just donate money and make phone calls. We have graphic designers, professional level video editors, Spanish translators, artists and musicians, lawyers, event planners—people who do these things professionally or at a professional outlet level and would love to either donate their skills to progressive causes and campaigns or provide them at a much fairer cost than a lot of DC consultants. To give you one very tangible example of how this can work, in 2009 we launched our first big issue fight for the public option. There was a moment where President Obama was going to give a big speech at Congress in September of 2009, and word got out that he might be on the verge of throwing the public option under the bus and we wanted to push back against that. We launched a petition to him and asked former members of his staff and his donors and volunteers to sign our petition and make a statement and pretty much go public in pressuring him to fight for public option. 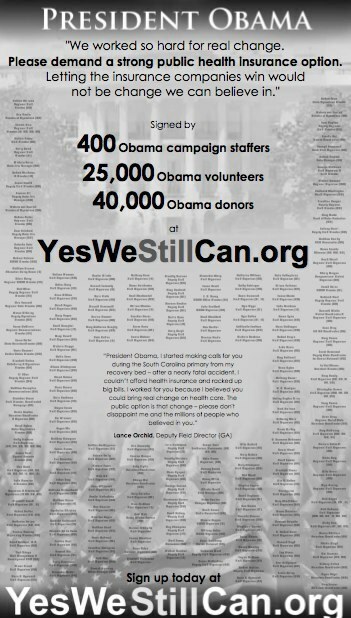 And eventually we wanted to take out a full-page New York Times ad that displayed the names of 400 Obama campaign staffers with all the titles and then list that we had 40,000 Obama volunteers and 50,000 Obama donors who were telling him a healthcare bill without a public option is not “change we can believe in.” And the question was, well we’re kind of a new organization, it’ll be hard enough to raise money to take out an ad in a paper, we don’t have an extra fifteen, twenty thousand dollars to spend on the design of it. So we sent an email to those people in the Next Generation of Talent Initiative who were designers, and we basically say, “Look we have a really tight timeline, we have thirty-six hours to turn this around, it’ll be a full-page ad, if you’re available let us know.” Six people were available on that timeline, and I said to them, “Okay here are the exact details, here’s what we’re trying to do, we’ll pay all of you $250 for a first draft, and if one rises to the top, we’ll pay that person $2,500 to work intensely over a 24-hour period to get this in on time. Of the six people, three submitted designs, they were all good, but one was clearly superior, clearly A-plus quality and we chose to work with him. TBQ: What ended up happening with that ad? Full-page New York Times advertisement funded by the PCCC. We were designing it for TV also, to make sure it looked good on TV. Keith Olbermann put the thing up on MSNBC, others talked about it as well. Then this 24-year old kid [the designer] who was not all that political ended up winning the American Association of Political Consultants Best Full-Page Ad of 2009. So he beat the consultants: we got a better quality piece of work for a fifth of the cost by this people-powered model of talent. One small example of how new practices can sideline consultants and multiply the cost savings across campaigns, you save millions and millions of dollars for progressive candidates. Our campaign software will be that on steroids. And the Next Generation of Talent Initiative will be in its most robust form this next election cycle than it has ever been. People might donate fifty bucks online, but they can do a lot more and do something that’s really fulfilling for them and is immensely valuable for our campaigns. And the same thing applies to our issue work. We also produce our own TV ads, often in the issue context, but we help campaigns produce them as well. The main thing that we do over and over again is find real stories of real people impacted by certain issues. If an 80-year-old grandmother is accusing Mitch McConnell of wanting to cut her Social Security [benefits] and telling a really emotionally persuasive story about what that would do to her life, that is not perceived as a negative attack ad. That is perceived as a regular person who has an important story to tell and is finally being heard in our democracy. Voters don’t like cookie-cutter ads, they’re not emotionally persuasive and come off as nasty for no reason; this is the antidote to that. Consultants don’t have the ability to make these ads because they don’t have a grassroots base. Even if they said ‘oh we’d really like to find this person,’ you can’t send out an email to 5,000 people in Kentucky and ask ‘hey do you have a social security story to tell us?’ But we can. And that’s one more way we give a leg up to our candidates. Someone telling a story in a beautiful way really impacts the entire debate. We’ve had the Republican Party try multiple times to take down our ads because they know they’re effective. We want people who are effective and who understand that being effective means mobilizing millions of people who are willing to go bat if they’re involved in a partnership. TBQ: Are there other issue-based initiatives on the agenda? AG: There are short-term victories but we’re also planning the long game. Some things will take years not months, but we have to lay the foundation in the short term in order to be successful in the long term. For the last couple of years there has been all this talk about, should we cut Social Security and Medicare benefits? The entire debate has been between doing nothing and cutting benefits. In that scenario, the best that progressives can hope for is nothing. That’s not really encouraging, especially as corporations cut pensions that they promised to workers. There are more and more retirees who worked hard all of their lives and need Social Security more than they have in the past. There are these twin bills that were kind of dropped in the hopper by two senators that would expand Social Security benefits instead of cutting them. One is Senator Tom Harkin from Iowa, the other is Mark Begich from Alaska, one of the top Democrats up for reelection [in 2014], one of the four Democrats to vote against gun reform. He’s very much perceived as a moderate but he’s out there being a champion for expanding Social Security benefits. Elizabeth Warren actually mentioned this bill to us for the first time, we investigated it, decided to partner with Harkin and Begich, and now have created an entire coalition around making this idea mainstream. We did polling that shows that even in a red state like Kentucky expanding Social Security benefits is supported by a two to one margin, and three to one in Texas. In purple states like Iowa and Colorado it’s supported by a really large margin. And of course there are big margins in blue states like Hawaii and California. So we’re building the case that this position is popular. There are still numbers showing how unpopular cutting benefits is. Then we’ve been doing a lot of press events around the country releasing these numbers, generating a lot of media coverage. One by one picking up new senatorial candidates for this idea—Brian Schatz from Hawaii who’s building his progressive credentials by being the only candidate in that primary to jump on the Harkin bill. There’s another current senator on this bill who’s kind of a big deal whom we’re going to announce next week [Editors’ note: Senator Sherrod Brown (D-Ohio) is working with Senator Harkin on this bill]. Our goal is not to pass the bill in 2013; our goal is to get enough legislative momentum and media momentum, so that it’s a credible idea in the mainstream discussion by 2013. Ideally that would be 20 senators who are on one of these two bills. Adam Green and Stephanie Taylor meeting with Congressional Progressive Caucus (CPC) co-chair and Representative Keith Ellison (D-MN) at Netroots Nation 2013. So in 2014 we have this credible idea that we can take to one of our candidates and say, Hey why don’t you poll on this issue? Prove in your own polling what we found in ours, which is that this is popular no matter where you are. Then, we can work with them to find really compelling Social Security stories and help them spend millions of dollars that they would spend anyway on campaign ads on big progressive, on-offense, campaign ads. At that point we’re spending millions of dollars through the election process educating the public. And having these politicians feel like their identity is wrapped up in this fantastic, on-offense messaging. Then we enter 2015 with a mandate. That’s when we try to actually do it. And if the White House opposes it, well then we can continue to build support and be within trekking distance of passing it in 2017. So that’s an example of a long game. It’s not just about living in the election cycle; it’s not just about here’s an idea, let’s do a petition to try to pass it right now, it’s a sophisticated approach where we make down payments on success along the way, with a big-picture game plan. Alexia Nader is a senior editor at The Brooklyn Quarterly and a freelance writer. She has contributed to the Los Angeles Review of Books, The Nation, and Oxford American, among other publications. She lives in Fort Greene, Brooklyn.